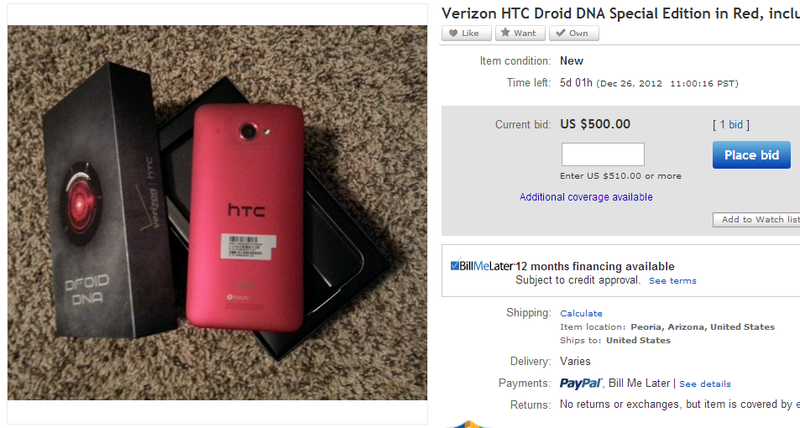 Limited Edition DROID DNA Devices End Up On eBay, Feel Like Getting Me a Christmas Present? Feel like picking up one of those limited edition DROID DNA devices that are exclusively for Verizon employees? If you head over to eBay, there are a few listings for the device, all of which are either already over or on their way to being over the DNA’s MSRP. That’s to be expected, right? For those interested, the limited edition variant has nothing different internally to the regular one. The only change is the red back, which could be enough for some people. Me included. Although, I can’t justify a purchase like that at this time of the year. Consider it added to my wishlist. You can check a few of the listings here, here, and here.